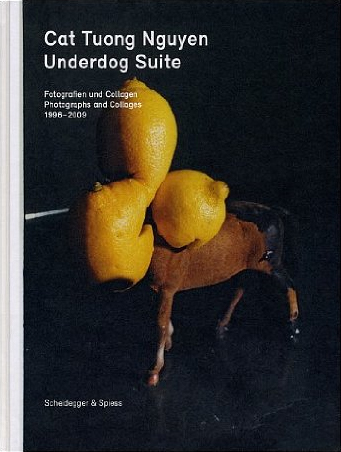 Underdog Suite, Photographs by Cat Tuong Nguyen. Published by Scheidegger & Spiess, 2009. Photographs by Cat Tuong Nguyen with essays by Burkhard Meltzer and Nadine Olonetzky. Scheidegger & Spiess, 2009. Hardbound. 312 pp., 545 color and 10 halftone illustrations, 8x10-1/2. Cat Tuong Nguyen's photographs and collages are a play on the construction of meaning in a world at once immediately traversable and so often utterly fragmented. Underdog Suite functions very much as a musical suite, working straightforward photographs, some almost snapshots, in concert with diorama-like arrangements of exploding toys and a patchwork of clipped headlines, painted-over newspaper images, rinds of fruit, and montage. Underdog Suite, by Cat Tuong Nguyen. Published by Scheidegger & Spiess, 2009. The book is playful in its seriousness, straying from brief interludes of definitive statement to wander a fugue of travel and politics. In "Terror Market," a tiny installation of a toy bus marked "international airport" is rocked by the firecracker-fueled matchbox truck detonating beside it, all before a backdrop of American dollar bills. In another shot, titled "Death Resort," tiny airplanes crash through plywood adorned with clipped photographs of magazine starlets and a spatter of fake blood. A statement is clearly being made, whether one considers the images as coming from a post-Vietnam or a post-9/11 world. But Nguyen's meaning is also personal, obscure, manifold.